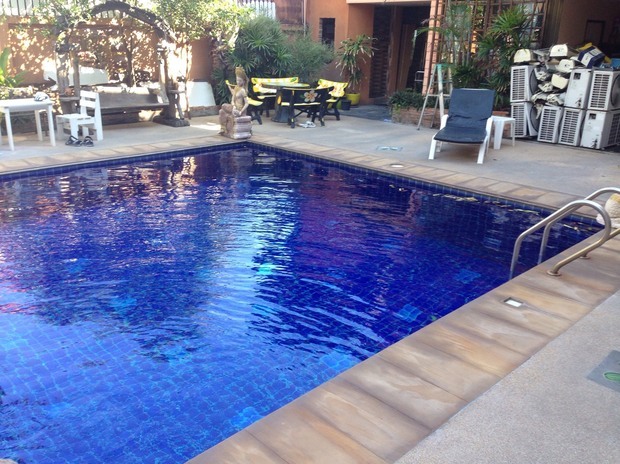 Guest House Pattaya.The Hideaway - GREAT accommodation at a GOOD price. Easy proximity to Pattaya nightlife. contact us for a price quote, we will reply very quickly. Type a keyword into the box on the right if you are looking for something specific. Q. Is there a seperate entrance or do I have to go through the bar ? A. Yes, there is a discreet side entrance with a key for 24 hour use. You can also access via the bar. Q Is there a daily maid service ? A Yes, your rooms will be made up every day if you wish. Towels will be changed, and linen as and when necessary. No extra charge. Each room has a Do Not Disturb/Tidy My Room door handle indicator. Maid service available until 5pm. Later requests for towel changes can be done at reception. Q Can I bring guests to my room ? Q Can I smoke in my room ? A We kindly ask you to smoke on the balcony. Ash tray is provided. Q Do you do breakfast. ? A We have great expresso coffee, and can rustle up toast, butter and jam, but for full breakfasts there are many specialists just yards away. Q Can you arrange a taxi for me ? contact her directly. She is very efficient and always replies rapidly (time difference withstanding). Q Is The Hideaway ladyboy friendly ? Q Is the Hideaway within walking distance to Walking Street. A Walking Street is about a 15 minute walk. Down to the Avenue Mall 150 metres, then left on 2nd road about 600 metres. Then right 50 metres to Beach Road and Walking Street. Q Is there wi-fi ? A Of course there's bloody wi-fi. The best around here. Q Do you take credit cards ? A Not at the moment, and never if can avoid them. Cash is King. ATM machines and Money Exchanges all within walking distance. Q Do guests have access to a nearby pool ? A For 100 baht you can access either Duannaming Hotel on soi Buakhow (30 second walk), or Mike's Mall Rooftop Pool (other side of 2nd Road 5 minute walk). Also Nature View, soi Buakhow for 200 baht. Q Where can I buy stamps for my postcards ? More frequently asked questions to be added as and when they are asked. Silly questions are also welcome. As are spellin mishtakes.